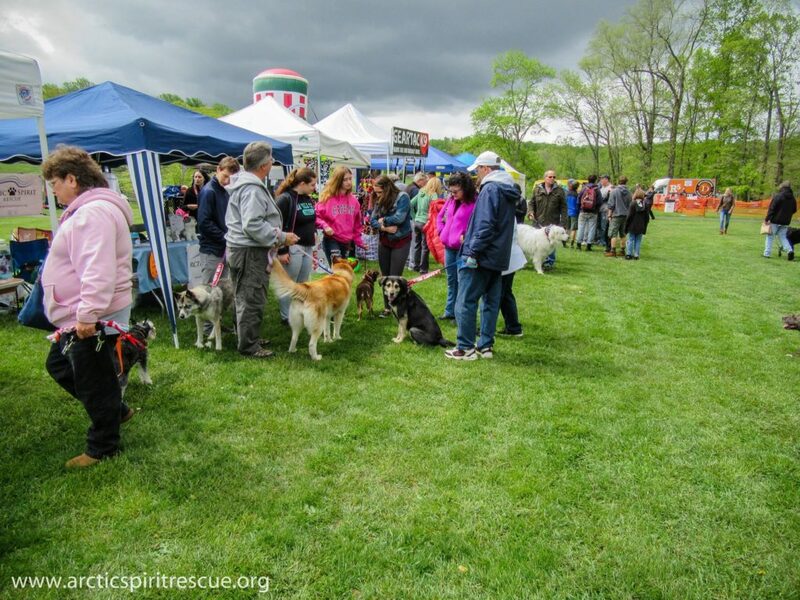 Last Sunday May 7th was the annual DeBella Dog Walk at Green Lane Park in Green Lane, PA. Arctic Spirit Rescue had the honor of attending this fantastic event run by the John DeBella Show and 102.9 WMGK of Philadelphia. Despite getting rained out the day before, dog rescues, vendors, and attendees were still there in full force. It was a great opportunity for the Arctic Spirit Rescue dogs and volunteers to make some new friends (2 and 4-legged varieties alike!). 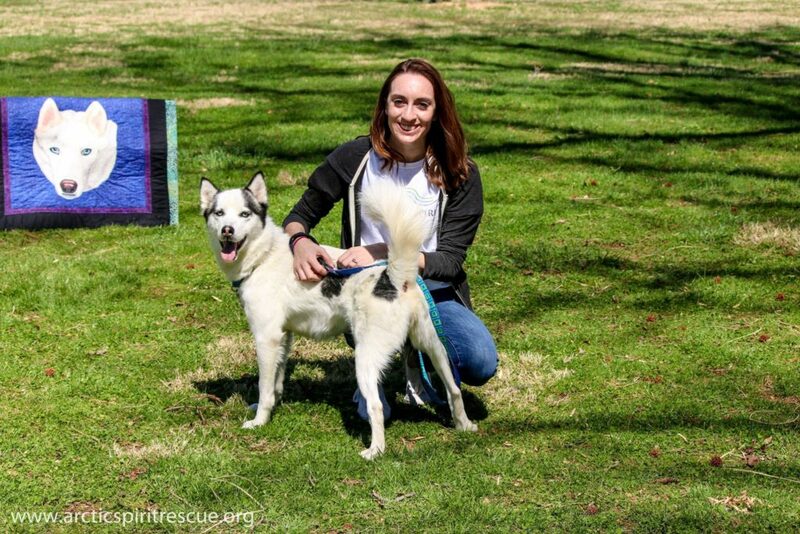 Even newcomer Tamika had a great time meeting new people at her very first public appearance! As always, the event ran flawlessly, all thanks to the WMGK team and of course John DeBella himself. We’d like to thank everyone involved with making the event happen, as well as all of the volunteers and attendees that made it possible. Be sure to check out the video recap above, or watch it on the Arctic Spirit Rescue YouTube Channel. You can also see more photos from the event via the Facebook photo album. Make Way For Our Newest Guest – Baloo the Alaskan Malamute! We don’t exactly know who said that but it seems to apply to our BIG new guest! 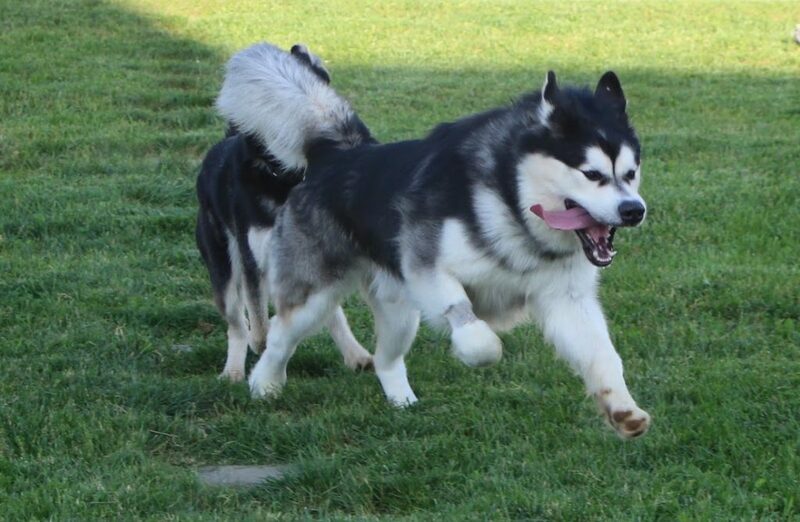 Meet Baloo – a 1 year old Alaskan Malamute. Everything about this boy is….big. His paws are big, his head is big, his tail is big, and best of all, his heart is big. He just seems to love everyone and makes the best of any situation. His innocent nature is infectious. Don’t be fooled though! He’s still a youngster and they tend to get into trouble. Since this guy can reach just about everything, there’s lots of trouble to get into! He’s a curious boy who will find something to do if you don’t keep him busy. Baloo came to us from a local shelter who obtained him from an owner who was no longer able to care for him. He’s spending some time in one of our experienced foster homes where he’s being thoroughly evaluated. We will then identify what we need to work on before he moves on to his forever home. First on the agenda are some basic manners. Since he’s with a pack of dogs accustomed to teaching their guests how to be a good dog, we’re already seeing some progress. His crate skills are improving and he’s enjoying the company of the other dogs. You can access Baloo’s bio here. Once we get to know him better we’ll begin accepting applications. 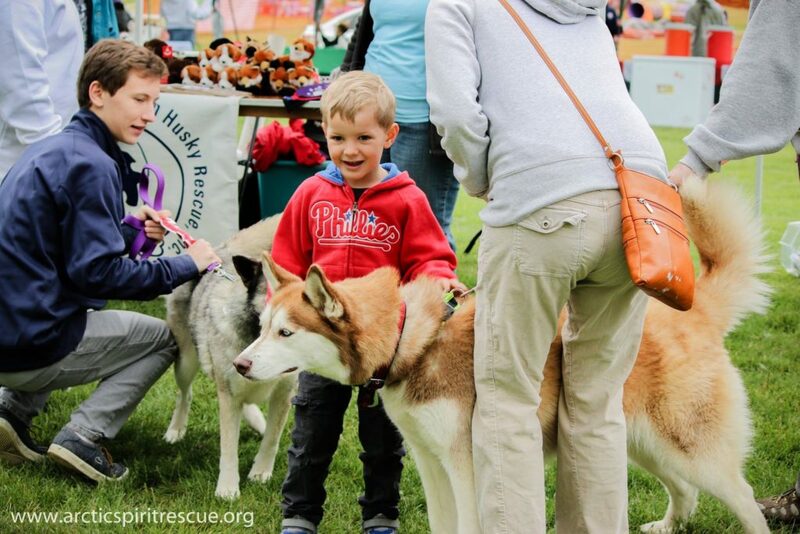 A priority will be finding an adopter who understands the needs of a young Malamute and can commit to continuing his training. Until then be sure to follow his progress on Facebook. Thanks again to all of the attendees, sponsors and volunteers! We had a fantastic time. 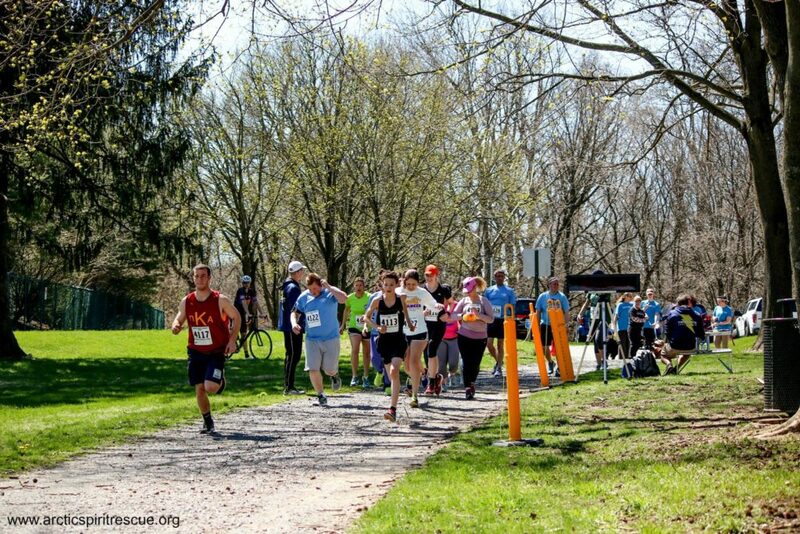 Be sure to check out the full event recap here. 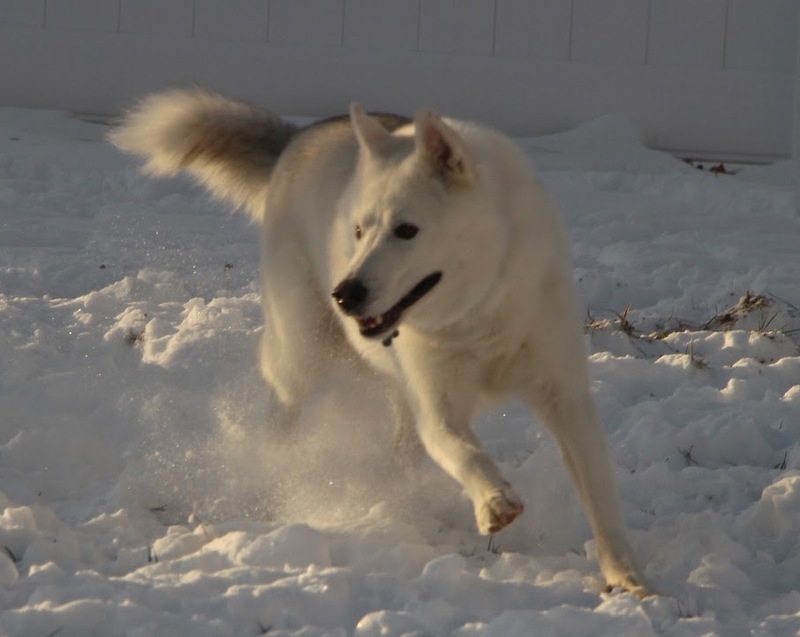 Also be sure to Subscribe to Arctic Spirit Rescue’s YouTube Channel. We plan on posting regular event and dog updates, as well as helpful educational videos about Northern Breed dogs and their care. With winter comes…..DOGS! December was a busy month for us at Arctic Spirit Rescue, and January is proving to be more of the same. Just before Christmas we were contacted by a local shelter who had a pair of female mixes. 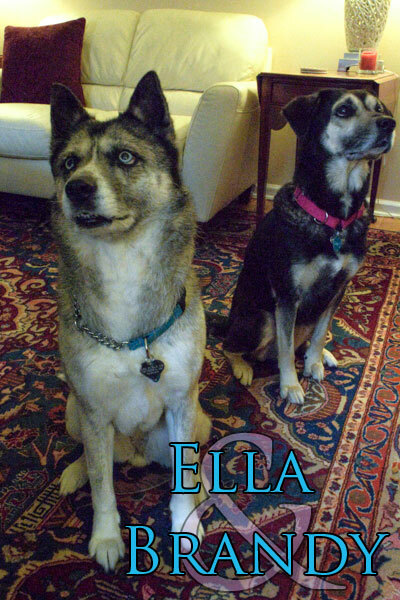 Ella – a Husky/Cattle Dog mix, and Brandy – a Hound mix, were reported to be a bonded pair and had been there for quite some time. These two social butterflies were often taken to events with no issues whatsoever but their adult ages (7 and 8) seemed to be working against them. There’s also a reluctance for potential adopters to commit to adopting two dogs rather than one. As most Northern breed owners know, two are often easier than one. It became obvious that these ladies needed a bit more help so the shelter contacted us. It was meant to be since we had an available foster home that was very willing to take them in. A transport volunteer was generous enough to dedicate part of his day off during the holiday season to spring the girls and they arrived at their foster home just a few days before Christmas. What a gift for them! No more loud, chaotic shelter, soft sofas, yummy treats, new girly collars, and lots of one on one attention. It doesn’t get much better than that. The shelter staff did the best they could and we’re glad they reached out to us. These ladies will make a wonderful addition to a low key home looking for some furry companions. Stay tuned for more updates as we continue to get to know them. They’ll be making their Meet and Greet debut soon so be sure to watch our Facebook page for our event schedule if you’d like to meet our ladies. Then came Jake! 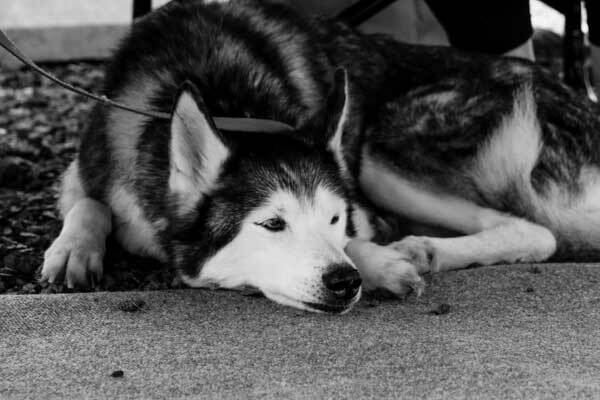 This large Siberian Husky is impossible to ignore. He’s as handsome as they come with a personality just as beautiful. This 7 year old came to us with the help of his prior owner and a local shelter who both recognized he needed more than either could give him. 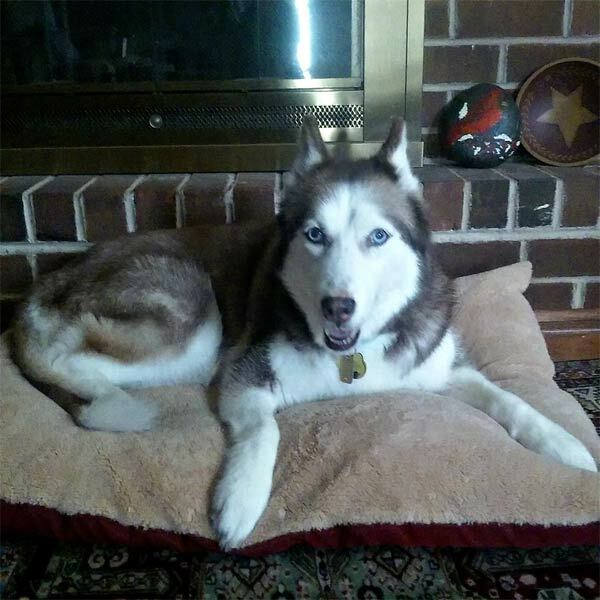 In typical Husky fashion he needed to be in a home with other dogs. It was a tough decision for them to relinquish him but they loved him enough to do what was best for him. From the moment he landed in his foster home’s yard it seemed as though he had been there forever. After the initial introductions he quickly moved on to playing with his new pack. This seemed to be the key to his happiness. He spends his days in a large fenced yard romping, running, and playing tag with his foster siblings then eagerly trots inside for a nap to recharge for the next play session. Life is good! Our handsome Jake will make a wonderful addition to a family with a secure fenced yard (he likes to dig! ), and at least one other dog of similar size and play level. No cats or small dogs for this guy though. None of these dogs would have been able to come to us without the help of our volunteers. From transport to foster it takes the love and dedication of kind hearted people that are willing to adjust their schedules – often with very little notice – to make sure these dogs are safe and loved. The paybacks are immense. There’s nothing quite like hearing that sigh of relief from a previously stressed or frightened dog. Seeing them eventually move on to their forever home is the ultimate reward. We thank all of the volunteers that stepped up for our new guests as well as those who generously donated towards their care. Be sure to follow us on Facebook and Twitter for frequent updates on these dogs. If you’re interested in adopting, check out the Adoption section of our website where you’ll find our adoption application as well as their profiles. 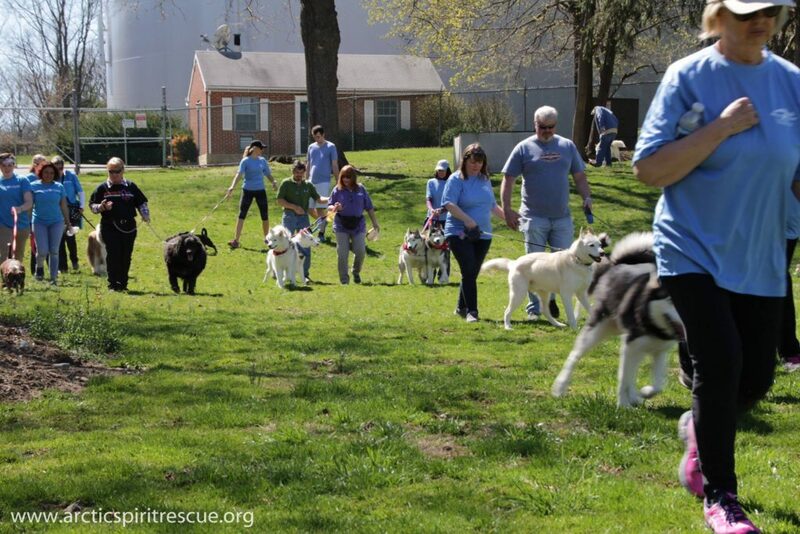 Donations also help with the care and future expenses for current and future dogs in need. The local shelters are bursting at the seams with adoptable dogs this time of year. Some may be older or have special needs and have years of unconditional love to give. Learn about how it might be easier than you think to provide a little extra TLC to a special needs dog. 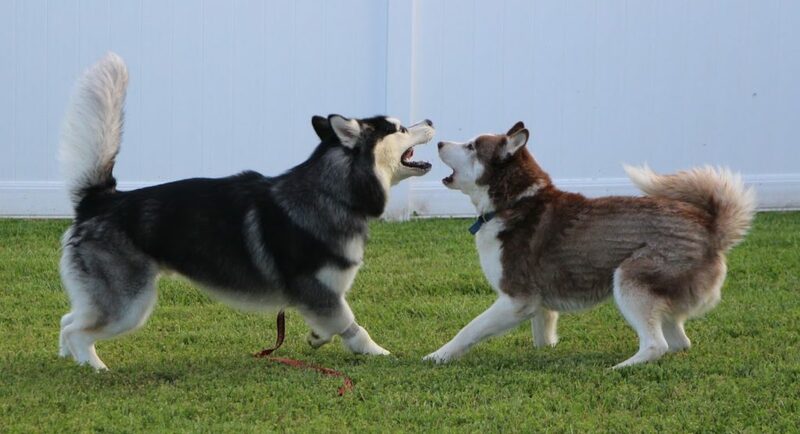 Training our dogs is all about communication. 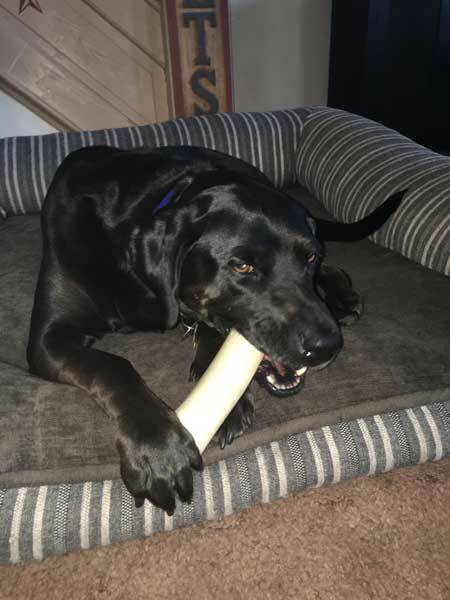 Clear, consistent cues enable our dogs to learn quickly and easily, while reinforcing the learned behaviors make the behaviors strong and long lasting. But how can we communicate to our furry, four-legged friends if they can’t see or hear us? In reality, training a blind or deaf dog is no different than you would train a dog that can see or hear. It’s as easy as ABC. An antecedent is something that causes a behavior to occur. A classic example is the ringing of the doorbell causing a dog to bark. When training, an antecedent can be a food lure, physical prompt, verbal cue, or hand signal that causes the dog to sit, down, come, or whatever behavior we are trying to train. The consequence is what happens after the behavior is performed. A positive consequence (reinforcement) will cause the behavior to increase, while a negative consequence (punishment) will cause the behavior to decrease. Every behavior is always preceded by an antecedent and followed by a consequence. Some of those antecedents and consequences occur naturally in the environment, but when we control the antecedents and consequences we control behavior. The only difference between a blind/deaf dog and one that can see/hear may be how the antecedent and consequence is applied. As stated above, a dog’s first line of communication is reading body language, so training a blind dog is more challenging. However, we can still use their other senses, especially a dog’s superior sense of smell, to teach them. Lure-reward training, coupled with clicker training, is a highly effective way to teach your dog new behaviors. This type of training simply involves using food to guide your dog into the desired position or behavior. You then click, or mark, to let your dog know he did the correct thing, then reinforce the behavior with the food. Through repetition and consistent cueing your blind dog can easily learn just about anything you want to teach him. Training a deaf and blind dog. A dog that is both deaf and blind presents a more complicated training challenge, as the antecedent – the thing that makes behavior happen – cannot be a hand signal or verbal cue. So how do we ask our dogs to do what we want? We use touch. A gentle touch to a particular place on their body can be their cue to perform a certain behavior. For example, if you are training your deaf/blind dog to sit you would touch your dog on her rear at the base of her tail, lure her into a sit, then reinforce the behavior with food. 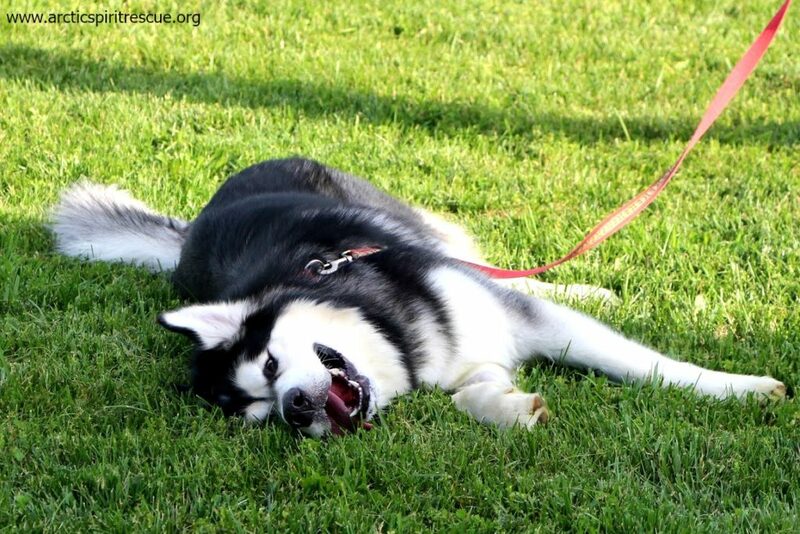 With the consistent steps of cue-lure-reinforce your dog will learn behaviors in no time. Dogs are born deaf and blind, and don’t gain their hearing and eyesight until about two weeks after birth. So dogs that are deaf or blind from birth seem to handle it quite well – it’s all they’ve ever known! On the other hand, dogs that had their hearing or sight then lost it have more problems adjusting to their disability, and more care and patience needs to be taken. Special needs dogs can, and do, thrive, but particular care must still be taken to ensure their safety. They may not be able to see or hear cars, predators, or other dangers. Use a secure, physical fence in your yard, and never leave them outside without direct supervision. Use crates and baby gates in your home to keep them from stairs or dangerous objects in your home. 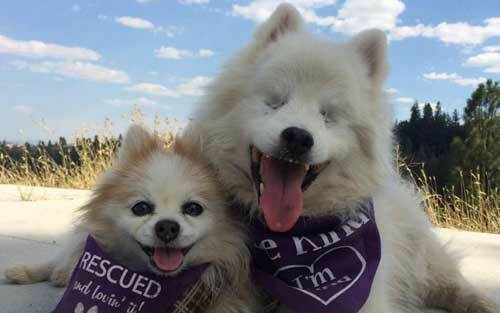 Deaf and blind dogs are no different than other dogs. They just hear and see with their hearts. As their caretakers it is our responsibility to accept them as they are and treat them with the love and respect that they, and all animals, deserve. 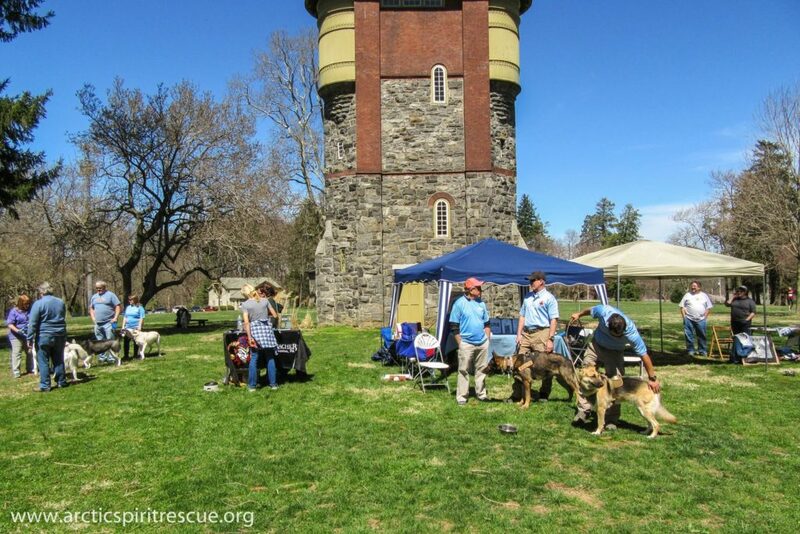 Jeff Dentler, a Certified Professional Dog Trainer (CPDT-KA) and Certified Trick Dog Instructor (CTDI), provides dog training and behavior modification to residents of the greater Pottstown, PA area. Contact Jeff at jeff@DentlersDogTraining.com or 610-505-0123. For more information and daily tips on training, exercise, health, and nutrition please visit DentlersDogTraining or like us on Facebook. Hello! Sallie here! I want to share with you my scary near death experience so maybe your lady dogs don’t have a similar or worse experience. When I came to my forever family, they were told that I was spayed but I wasn’t. I kept getting sick, but my new family were very good about getting me the vet care that I needed, and quickly, otherwise I may not be here right now. When I got very sick, I didn’t want to eat but was drinking a lot of water. I was tired and kept having accidents all the time, then started having trouble getting up and was very weak and shaky. It turned out that I had Pyometra; it was scary and painful, and mom said it was very expensive to treat. She now calls me her “million dollar baby”. Pyometra is a severe infection of the uterus that is caused by hormones and bacteria. It is a serious and life threatening condition that must be treated quickly and aggressively, because if the uterus ruptures it becomes toxic in a girl’s abdomen- kind of like what can happen with appendicitis. Pyometra can happen in any female dog who hasn’t been spayed and is common in older females, but it can happen with only 1 heat cycle. The best prevention is to have all female dogs spayed, preferably at or before they are six months old and have their first heat cycle. I was lucky and survived, but many girls don’t. So please, help us spread the word that it’s important to spay your beautiful female pups. Not only does it prevent unwanted pregnancy but it can save their lives! With a heavy heart we must add that Sallie lost her battle with health issues. There were complications due to her late veterinary care and she passed away two weeks ago. Sallie is forever loved and greatly missed. 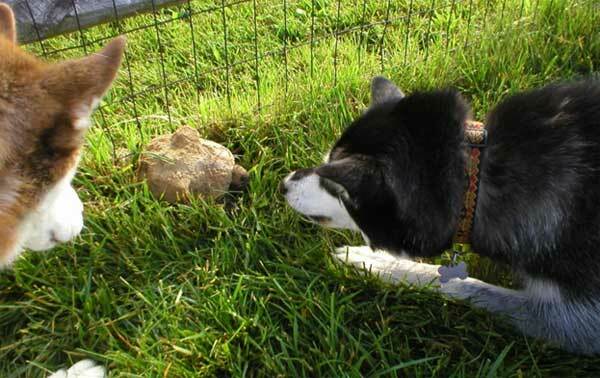 Huskies and Malamutes are typically friendly pups, always on the lookout for new pals to hang out with. Of course, their exuberance is not always returned by the other party. 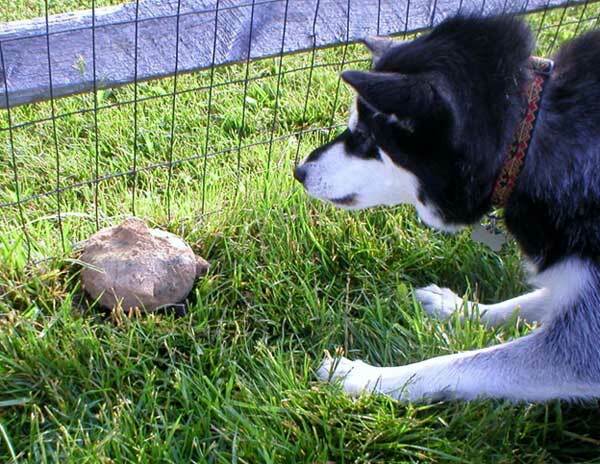 Some time ago, Lucy and Kosmo tried to make the acquaintance of a snapping turtle who was wandering through the yard. Despite their best efforts to chat with the little guy, he was not interested. So much so that he took a bite out of Lucy’s nose to get his point across. Fortunately, Mom stepped in, and further injuries to all parties were avoided. Phew! Fast forward a few years to the present day, and it looked as though history might repeat itself. 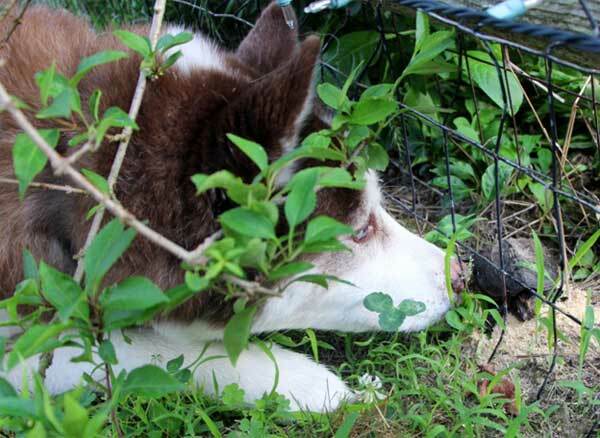 Lucy didn’t bother warning Calvin that turtles bite, so he didn’t think twice about getting nose-to-nose with a potential new friend. Needless to say, the turtle was not impressed. Poor Calvin; Mom made him go inside before he and his new friend could really get to know each other. Maybe next time! My dog is chewing everything! HELP! MY DOG IS CHEWING EVERYTHING! It is true that dogs, especially puppies, chew. A lot! But there are a couple of things to remember when it comes to chewing. Number one: it’s normal. Chewing is all about toning jaw muscles. And even though dogs no longer need to split bones and grind down marrow to survive, the urge is still hardwired into them. Number two: it’s not a phase. Yes, puppies chew more. But chewing isn’t like teething in babies; it won’t peter out and eventually stop. All dogs chew some, and some chew a lot! So chewing is not really a behavior problem, but a normal and healthy activity that should be promoted. However, that is not to say it’s not a problem when Fido has acquired an affinity for chewing the leg of your dining room table. But what to do? The Things To Chew On. Edibles: Chew bones, pigs’ ears, bully sticks, greenies, etc. Non-Edibles: Tennis balls, nyla bones, Kongs (without food), etc. Dissectible Things: Plush toys, rope toys, Hide-A-Bee (Squirrel, Bird) etc. Puzzle Toys: Stuffed Kong, stuffed marrowbone, tricky treat balls, etc. Step 1. Prevent mistakes. When you can’t supervise, put your puppy or dog in an enclosed, dog-proofed area with a sanctioned chewie. Step 4. Repeat if needed. 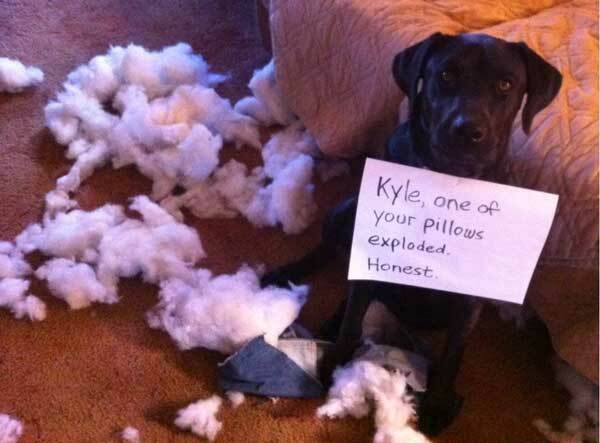 If mistakes happen a lot then you are giving your dog too much freedom, too soon. Revisit step 1. Go back to using an enclosed, dog-proofed area until your dog is consistently making better chewing choices. Remember, one of the basic tenets of behavior training is behavior that is reinforced gets stronger. The more you reinforce the behavior that you WANT (chewing appropriate things), instead of focusing on the behavior you don’t want, the more that desirable behavior will increase until it becomes the chosen thing to do. Training Tip: Do not keep all toys out all the time. Put at least half away and rotate different types of chewies to keep your dog interested. Troubleshooting: Is your dog suddenly chewing a lot? Is this a new habit? Make sure he is getting enough physical and mental exercise. Bored dogs will find something to do, and it usually isn’t something you like! Jeff Dentler is a Certified Professional Dog Trainer and owner of Dentler’s Dog Training in Pottstown, PA. For more information about Dentler’s Dog Training and to sign-up for his newsletter, visit DentlersDogTraining.com. For daily tips on training, exercise,, health, and nutrition please become a fan of Jeff on Facebook. Photos courtesy of Jeff Dentler. When you welcome a dog into your life it doesn’t take long for you to realize how many wonderful lessons they have to share. Some are pretty obvious like how easily humans can be manipulated with cute floppy ears and a head tilt. They engage us in a rousing game of fetch then before we know it we’re the ones doing the fetching. It’s a strategy not an accident and we have been taught the rules of their game. When you share your life with a special needs dog, which is often a senior with a laundry list of conditions that would no doubt sideline a human, the lessons are even more prevalent. But the ones we can learn the most from are the ones you may might have to watch carefully for. Take our 11 year old female for instance. She’s quite a character and has been a member of our family from a very young age. Through the years she has grieved as her other pack members left for The Bridge, welcomed new pack members with open paws, taught snarky foster puppies manners, and loved each of us unconditionally. She’s looking quite pleased with herself these days, despite so many hardships. To most, her satisfaction may not be obvious. To us, it represents so much more. Our lovely matriarch suffers from several debilitating and chronic health issues some of which cause intense spinal pain at times. With the constant care of a team of veterinarians that have followed her progress carefully we have found medications and supplements which make her more comfortable and are constantly being adjusted. Despite this, there are days that merely walking outside for a breath of fresh air is the equivalent of a 10K run. But due to her indomitable Siberian spirit she presses on, viewing each day as a gift to be celebrated. There’s no self pity for this girl! 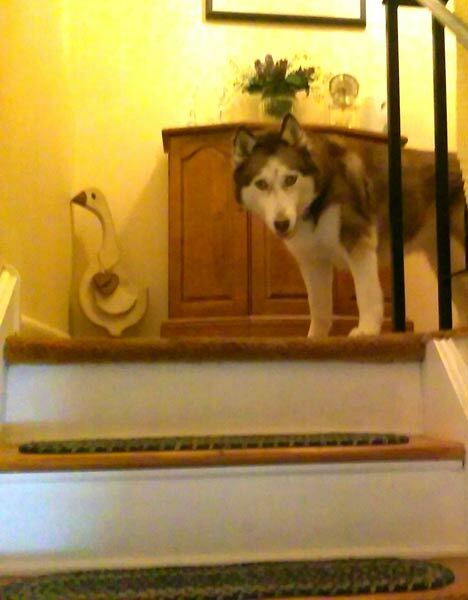 On some days she will climb to the top of the stairs. There’s never a real need to. She just wants to. Shyla then basks in the glow of her accomplishment and immediately makes a careful downward descent. Her day is complete and she’s satisfied. So – take a lesson from this girl’s book! Embrace the day and celebrate the victories. It’s the little things.